Like most people, you probably learned the basic rules of grammar in school. And like many people, you’ve probably forgotten much of what you learned. Is ending your sentences with a preposition a bad practice? Are there hard and fast rules for when to use who, that or which? Where do the comma and apostrophe go? All these questions and more can plague both amateur and professional writers. Our online spelling and grammar checker will answer those questions and (hopefully) help you gain more confidence in your writing. Teachers and instructors expect your papers to be error-free. But let’s face it, even native English speakers are prone to silly mistakes. That’s why proofreading is absolutely critical in ensuring your work is perfect. Yes, even expert writers sometimes get tripped up over the details of English. If you work with an editor, little blips aren’t that important. If you have to edit your own work, our automated proofreading tool is your new best friend. Even in these days of text speak, 120-character thoughts, and casual blogging, grammar and spelling still count. We believe the ideas expressed are more important, but these ideas may not reach anyone if they’re delivered messily. Hence, poor grammar can affect your career. Many studies have proven that poor communication on the job causes bad impressions, errors, delays, and lost clients or deals. Off the clock, communication problems lead to distrust and misunderstandings. And if you’re a student, English errors result in low marks. Whatever the case, we can help you prevent those errors. Take a look at our infographics and blog for easy but detailed explanations of even hard-to-grasp topics. In a hurry? 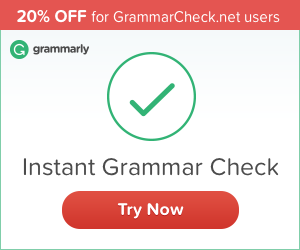 Use our online grammar and spell checker, and in a minute, you’ll be certain that you’re putting out quality material for your readers. Using our online editor benefits you in several ways. First, no software installation is required. Your information is safe and secure (text is never cached in our servers), and you get your results almost immediately. Just type the words you want to check into the text field and click one of the two buttons underneath to get started. Colorful underlined prompts will point out spelling errors, grammar suggestions, or style suggestions. Being able to write without worrying about mistakes can be freeing. But there are many other benefits of using a proofreading tool. Sometimes, your words are all you have. If you write for a living or write many papers for college, flawless grammar and spelling is essential. But we never stop learning. It’s a lifelong process. When trying to convince your reader of a specific point, your primary concern is to get your message received and understood. The last thing you want is to be criticized for your poor grammar and spelling. Your reader may not even want to continue reading your paper if errors are present. Checking yourself is the quickest way to improve your audience’s attention and interest. When you start proofreading your texts, you’ll learn how to spell new words properly as you go along. New vocabulary enables you to express your thoughts better and explore different perspectives. A larger vocabulary also increases your writing confidence and reduces common mistakes. It’s crucial to establish authority if you write for a living. Writing mistakes may cause people to doubt that authority. As a writer, deliver your message from a position of power and not from one of weakness. Remember that people are drawn to winners and success. If you have to write lengthy business reports, poring through every work you produce can be time-consuming and worrisome. You have to proofread everything, but you may not have the time to do so. Our online checker can save you editing time: with just a few clicks you can correct all mistakes that slipped into your text. Saving time means saving money! Obsessing over one paper for days likely isn’t the most profitable use of your time. When you scrutinize your texts, you won’t have to fear reproach by your professor, boss, or colleagues. Demonstrating your mastery of spelling has several benefits. Also, your audience may look up to you for having strong spelling abilities. Knowing how to spell is essential for any line of work. You wouldn’t want to advertise luscious deserts at a restaurant any more than you’d want to prescribe the wrong medicine to a patient. You might not hurt anyone in the first scenario, but you’d still risk losing sales and gaining a bad reputation. Using a tool to prevent such mistakes will give you the boost in writing confidence that you need to win jobs and advance in your career. So start now and instantly correct any grammar mistakes, get vocabulary suggestions, and check your text for plagiarism, whether it is intentional or not—well, you have to be certain. But don’t just blindly trust technology. Always make sure you give your texts a final proofread before you publish or send them out.